The Extreme Sailing Series in Cardiff sets sail this week, marking Wales' debut on the international catamaran stadium sailing circuit. So far this year, the Extreme Sailing Series regattas in Muscat, Qingdao, Istanbul and most recently on the Douro river in Porto, has been dominated by British Olympic Tornado sailor Leigh McMillan and his The Wave, Muscat team. They have triumphed in all, but one of the previous events but as McMillan muses, it is getting harder to retain an advantage, especially with three other teams – their own stablemates Oman Air, the Austrian Red Bull Sailing Team and the French on Groupe Edmond de Rothschild. 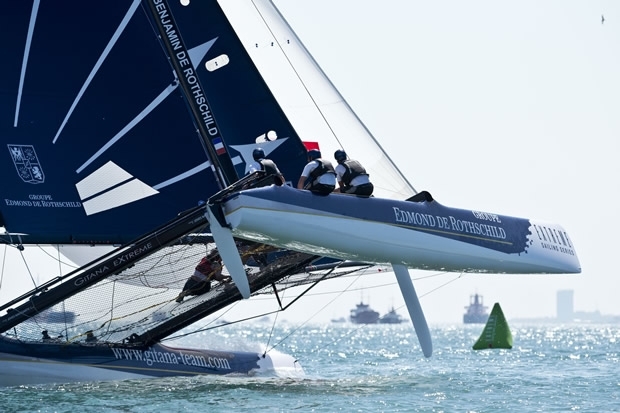 Groupe Edmond de Rothschild suffered serious damage to their Extreme 40 on the final day of racing in Porto, ultimately costing them their place on the podium. They are more determined then ever to claim their first victory this year. Two new crew members will be racing in Christophe André, who last sailed on the circuit in 2011 and brings America’s Cup, match racing and offshore experience to the French team. Conversely Romain Motteau is a newbie to the Extreme Sailing Series but is a past Youth World Champion in multihulls and is sure to find his Extreme 40 feet quickly. Andrew Walsh will remain in the driving seat of the British GAC Pindar for a second consecutive event with a few new faces amongst his crew. Team GBR 49er sailor Rick Peacock returns to the Extreme Sailing Series after debuting at the 2011 UK event aboard Aberdeen Asset Management, while American Laser Radial gold medallist Anna Tunnicliffe will be calling tactics on board. Tunnicliffe will be one of two women competing in Cardiff; the other is Olympic silver medallist Hannah Mills on the local entry Team Wales. Welsh spectators and visiting public are expected to turn out to watch the Extreme 40s competing as Cardiff Bay is transformed into a water-borne stadium race course with viewing areas on all sides. The Extreme Sailing Series takes place as part of the annual Cardiff Festival, the UK’s biggest free outdoor festival. The nine Extreme 40s will race on Cardiff Bay from the 30th August for four days, with the event opening to the public on 31 August. The fleet will race in the stadium race mode synonymous with the Extreme Sailing Series, putting the Welsh public at the heart of the action.